Located about 11 kms from Thanjavur on the road to Thiruvayaru, this place is called Kandiyur in memory of Lord Shiva, also known as Kandeeswarar, who got salvation from the Brahmma’s curse. The Lord of the temple is praised by Saint Tirumangai Azhwar in his Mangalasasanam hymns. Panguni Brahmmotsavam in March-April; Aipasi Pavithra Utsav in October-November; Vaikunda Ekadasi in December-January and Karthikai Deepam in November-December are the festivals celebrated in the temple. The temple ranks among the 108 Divya Desas. The noteworthy feature is that all three Lords Brahmma, Vishnu and Shiva grace the devotees together in the temple. The temple of this sthalam is 222 feet in length and 115 feet broad in the breadth. Lord Shiva, who is one of the popularly called "Mummoorthy" is given the Curse (Saapan, which is due to the bad activity when done on others) when he pinched the head of Lord Brahma and Brahma's head got attached (stuck or pasted) along Shivas hand. After this incident, he got the "Brahmagarthi Thosham", he lost all his wealth and finally, he begged for food and led his life. Since, he begged for food, he is also called as "Pikshandavar". Piksha means begging for some need. And finally he got the Saabba Vimochanam (getting out of the god's Curse (saabham)). This is the puranam that is told here in this sthalam. Since, Brahma devan sabham was warned (Kandanam in Tamil) in this sthalam this sthalam is called "Kandiyoor". The temple is one among the 108 divyadesams of Sri Vaishnavas coming under Choza naadu. The temple is also known as Pancha Kamala Kshetram. Lord Hara saabavimochana perumal presides here in a standing pose and is also called Brighunathar or Balinathar. The utsavar is called Kamalanathan and thayar is Kamalavalli thayar. There is a separate sannadhi for thayar. The temple has a 3 tier rajagopuram with 2 prakarams. As Perumal granted relief to Lord Shiva (Hara) of a curse, He is named Hara Shaba Vimochana Perumal – Hara-Shiva, Shaba-curse, Vimochana-relief. This is one of the 108 Divya Desas of Perumal. According to scriptures, the temple was built by Emperor Mahabali. 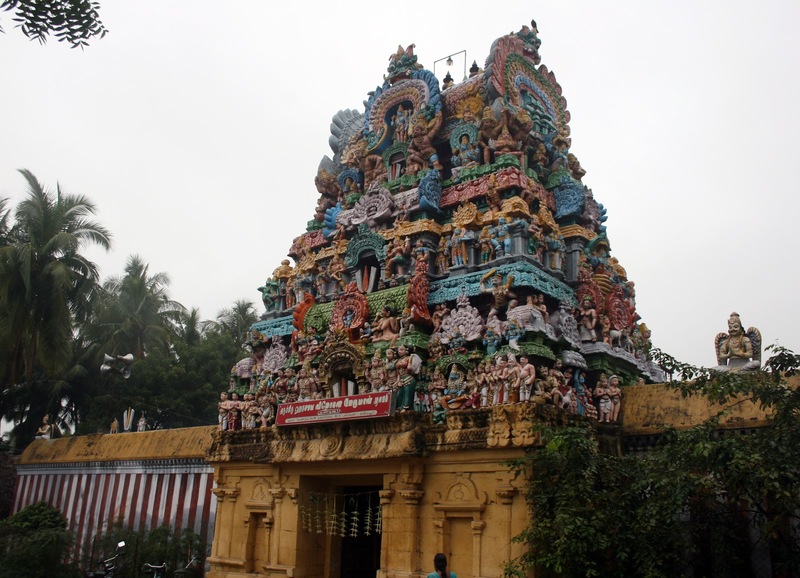 Lord Shiva has His temple here and is praised as Kandeeswarar. 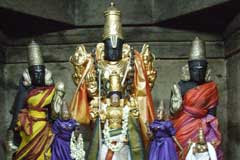 The place has the reputation of being honoured as Mum Moorthy (three Lords) Sthala. Since there is no temple for Brahmma, He has His place in Kandeeswarar temple gracing with Mother Maha Saraswathi. The author of the celebrated book ‘Sri Krishna Leela Tharangini’ belongs to Tirupoonthuruthi near Kandiyur, a stauch devotee of this temple. Lord Shiva has five faces praised as Eeshana, Tatpurusha, Agora, Vamadevam and Satyojatham. Lord Brahmma too had five faces earlier. Therefore, he developed pride that He was equal to Lord Shiva. Angry Shiva simply plucked the centre head of Brahmma. The head stuck to his hand and did not fall down. Lord Shiva, to wash off the Brahmmahathi sin wandered places with the head of Brahma. Lord Shiva went around the world on a pilgrimage to find salvation from the curse by begging for food, with Brahma’s skull as the begging vessel. Every time someone filled the vessel with food, it vanished immediately, to Shiva’s horror. Finally on reaching Uttamar Koil, Goddess Lakshmi filled the vessel with food ending Shiva’s hunger. However, to Shiva’s dismay, Brahmma’s skull still lay fixed on his hand. Vishnu answered Shiva’s prayer for salvation, and asked him to bathe at Kandiyur. It is believed that Shiva prayed to Goddess Kamalavalli and Vishnu at Kandiyur and attained salvation from Lord Kamalanathan here. Finally, the head fell at a place. Lord Vishnu was present there. This is that place where Lord Hara Shaba Vimochana Perumal blesses the devotees with Pooranavalli Thayar - Kamalavalli Nachiar. This is the sacred place that relieved Lord Shiva Himself of His doshas. Hence, every dosha faced by devotees will disappear if they pray to Perumal here. The temple is in Tanjavur/Tanjore district of Tamilnadu and is close to Thiruvaiyaru. It is about 2 kms from Thiruvaiyaru and around 11 kms from Tanjore on the main road itself. If a taxi/auto is booked from Kumbakonam to Tanjore, along with Thirukandiyur, one can also visit Thirukoodalur, Thanjai Maa Mani, Pullam Bhootangudi, Thiruaadhanoor and Thirukapisthalam.